With Windows 10 Build 14393 finalized as the RTM build for Windows 10 Anniversary Update (version 1607), any bugs that discovered between now and official general availability of Windows 10 Anniversary Update will come as ZDP (Zero Day Patch) in the form of individual updates or cumulative updates. As such, Microsoft has released a new update for Windows Insiders on the Fast ring, which updates the Windows 10 Anniversary Update’s build version and build revision from 14393.0 to 14393.3. The update comes as a Cumulative Update for Windows 10 Version 1607 (KB3176925). Fixed an issue where keyboard input on some Windows tablet devices would not rotate to landscape normally. Fixed an issue that results in Windows Updates being delayed on systems with Connected Standby. Fixed a problem with text input with Korean Input Method Editor (IME) in some Store apps. Fixed an issue causing Store apps to stop launching due to a licensing issue. Fixed an issue with apps that synchronize using DDE for inter-process communication. If you have installed Windows 10 Build 14393, and are still set to receive Windows Insider Preview builds in the Fast Ring, go to the Settings app -> Update & Security -> Check for updates to get the latest patches for your system. Not on Windows Insider program but already running Windows 10 Version 1607? You can always download the update .cab file from Microsoft’s server, and install the .cab cabinet files manually. 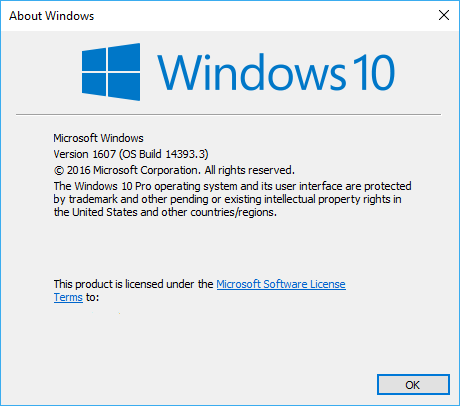 KB3176925 is available as Windows10.0-KB3176925-x86.cab for 32-bit version and Windows10.0-KB3176925-x64.cab for 64-bit version. However, KB3176925 is likely not be the only updates or last cumulative updates when Windows 10 Anniversary Update drops early August. Likewise, the build version for Windows 10 Anniversary Update at official release is likely to be higher than 3. In fact, Microsoft has compiled build 14393.5.